Also available as an eBook in the Amazon Kindle Store and in the Google eBookstore. Jane Rzepka's stories are about life as a Unitarian Universalist, and what the world looks like from a deeply Unitarian Universalist perspective. Her whimsical and poignant reflections span amusement parks, Tibetans, Jesus, time capsules, history, zip lines, gods, dinette sets, Passover and silence. 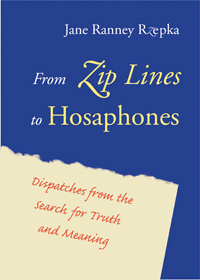 From Zip Lines to Hosaphones reminds us, delightfully, of the depth and breadth of Unitarian Universalism. There is a free Small Group Ministry Guide by Laurel Hallman available on the Skinner House Books Companion Resources page. Who Gets to Be Right? We can wear stripes with plaids now, and socks with open-toed shoes. I know, because I read it in a magazine. "Break the rules," it said. "It's time." I hate to say it, but rule breaking just might be right up our alley. Maybe it's not the positive tone we try to strike in describing our religion, but I'm going to say right out loud that Unitarian Universalists don't believe in a lot of the rules that our religious neighbors take for granted. Here are nine rules to break regarding religion, just as the magazine did regarding fashion. I'll leave it to you to dream up the tenth. You have to sign on to a list of beliefs. We don't have a list of beliefs—no creed; no dogma. Ultimately, you need to do the work of creating your religious beliefs yourself. You can grow them. You can change them. You can doubt your beliefs, talk about them, try others on for size. Each of us has a unique spirituality, and Unitarian Universalists have a long history of thinking differently as we walk together. We ourselves are the powers that be; there is no hierarchy. Unitarian Universalism is a democratic religion. The members of the congregation are the boss. You can vote to hold services on Thursday at the zoo instead of Sunday in the regular place; you can criticize the minister—heck, you can fire the minister; you can donate the entire congregational budget to . . . well, the mind boggles. Lay people are powerful, and they're where the buck stops. You must perform the rituals. We have no prescribed rituals. Some Unitarian Universalists appreciate ritual, some do not. It's as simple as that. You decide. If you want to welcome your baby into the world with a service, that's great. If you always take a moment for gratitude before eating, or begin each day with music, a poem, or tea and the Times, you may feel the better for it. If a regular practice enlivens you and urges you toward the good, you have found your ritual. You have to believe in God to be religious. We all know people who think that a person cannot be religious—or even behave—without believing in a god or gods. Unitarian Universalists are free to live their experience of both heart and mind, welcoming the atheists, humanists, agnostics, and those beyond categorizing among us, as well as those who find meaning in a personal or impersonal god. Your religious beliefs should be based on faith. Our religious beliefs are based on reason and experience. Faith is optional. If you're inclined toward the empirical and experiential, Unitarian Universalism will work fine for you. If faith provides you with a spiritual strategy, and it doesn't contradict what we know to be true, then faith is yours. There's room for us all. Some objects, spaces, and events are inherently sacred. Surely we feel grateful, respectful, appreciative, even wowed at times, but we aren't accustomed by history or tradition to set spaces, objects, or events apart from our ordinary lives. We'd rather they were close at hand. Throughout our history, we have often identified with theological heresies. Are human beings depraved at birth? Unitarian Universalists say no. Are events predetermined? We say no. Do people go to hell? No. Is Jesus God? Again, no. Are scriptures infallible? We say no. I have heard that when the late Dana McLean Greeley, then president of the Unitarian Universalist Association, met with Pope John XXIII at the Vatican II Council, the Pope said, with a twinkle in his eye, "You made a religion of all our heresies." The Pope was right. Religion runs the gamut, and for us the gamut includes fundamental joy, bemusement, and the frequent hearty laugh. We live a positive religion that embraces what is good in the world, including simple pleasures that remind us how wonderful it can be to be alive. We find no particular merit in the stuffy. To chuckle over a good-natured story during a memorial service, to emerge from meditation with a smile, to erupt with happiness at news of a new baby, to glory in the fun of a job well done—it's all religious. If I do say so myself. In our diversity, we embrace more diversity still. We stand for freedom. We nourish one another. We look forward to scientific breakthroughs; creative social justice initiatives; new ways of peace, both inner and outer; and the adventures and styles and contributions of those who are younger. We try, anyway. Revelation is not sealed. "Jane Rzepka is a delightful person, kind and pragmatic, passionate and intelligent. We'll be reaching for this book over and over as we prepare sermons, open board meetings, introduce friends to this faith, or deepen our own." "Intelligent, witty and insightful, this new collection makes you wish you could see the world with Jane's eyes all the time, and happy to share her view for a while." "Whenever Jane speaks, I listen. Whenever she writes, I read. You should too-and this book is your chance."